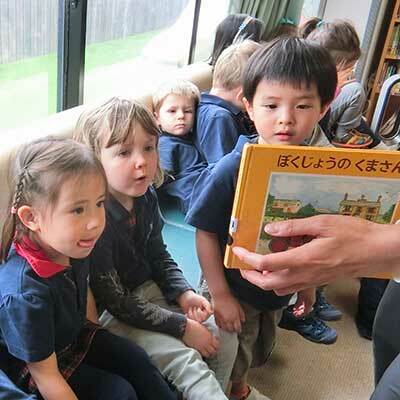 Dual Immersion (DI) classes are conducted in both English and Japanese, alternating on a regular and predictable schedule. The DI program started in 2002 and the number of classes have expanded given the program’s popularity and success. Bilingual and immersion programs are growing rapidly worldwide due to changing global demands, multi-lingual/ multi-cultural families, and the interest of monolingual families in having children learn a second language. With the rapid growth of programs that cater to bi/multilingualism, there exists several immersion education models. Willowbrook believes in a curriculum that is taught in English half of the week and in Japanese the other half. This means that Japanese and English are used as the medium of instruction, and not taught as separate subjects. There are many factors that make this program effective: environment, resources, teachers, and parental support. The classes in the English/Japanese DI program are Yama/Mountain (2-3 years); and Matsu-Pine Tree/Matsubokkuri-Pinecone, Take-Bamboo/Takenoko-Bamboo Shoots and Sakura-Cherry Blossom/Sakuranbo-Cherry (mixed 3-5 years). When dividing into age groups for various academic activities, Matsubokkuri, Takenoko and Sakuranbo are 3-4 years and Matsu, Take and Sakura are 4-5 years. Older children will be given time to concentrate on English academic skills to prepare for kindergarten. The younger class, Yama, has English for half of the day, and Japanese the second half. 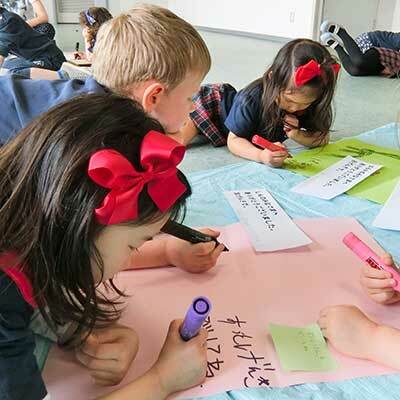 In the 3-5 years old classes, the curriculum is taught in English half of the week and in Japanese the other half. In both cases, languages are used as the medium of instruction and not taught as separate subjects. The Yama program is offered for two, three or five days per week. The older classes require five days per week. - Environment: To designate the language, the room decorations will change to help children immerse themselves in the language of the time/day. The Lead Teacher will conduct all activities in the language of that time/day. - Resources and Materials: Preparation of resources and materials is an integral part of an ideal learning environment. The WIS resources have all been prepared to support the bilingual program. Books are translated in both English and Japanese, and supplies are also carefully chosen according to language and culture. - Teachers: The DI program consists of two Lead Teachers (a native Japanese and a native English speaker) who alternately take the lead based on the language time/day. 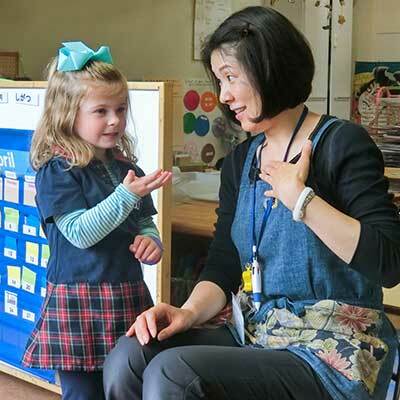 The two teachers accompany students from Japanese time/day to English time/day and create a close relationship between teachers and students that is important in the development of young children. The DI teachers are dedicated to bilingual and multilingual education and are engaged in continuing education to broaden knowledge and skill expansion in this growing field. This program, more than any, requires parental support and dedication. It is essential that students have language support at home to develop their first language along with their second (or third, or fourth) language. As language and communication are an integral part of cognition and learning, parents need to be aware that extra support is needed in the DI program. A typical schedule is as follows, though varies based on the class, age level, weather, etc. Willowbrook also offers an after-school Sora class (conducted in English and run by Willowbrook teachers), or many other after-school programs to extend student learning after the DI program finishes. Please review the After School section of the website for details.